July, August, and September mean whale watching season in Mozambique is in full swing! Come and experience these ethereal mammals in all their glory while you indulge mind and body on some of the best beaches on the African continent! Mozambique is a whale watching destination second to none – from the south at Ponto do Ouro, up past Maputo to Inhambane and then north to Pemba, you can see these majestic marine giants between June and October as they travel to the warmth of the Indian Ocean to mate and have their calves. Getting to Mozambique to do some whale watching, but staying at the ideal location may increase your chances of spotting whales more often. So chose your accommodation carefully based on the properties offering this activity, and the level of service they can provide. Below are some of our recommended options for your holiday to consider. In Mozambique, you may hear their song if you decide to go whale watching from Massinga Beach Lodge near Inhambane. From Massinga you can enjoy some whale watching along the coast, you could see up to 30 whales in one day! You will know a Humpback whale when you see one thanks to its exciting acrobatic displays when they throw their huge bodies around, hitting the water with huge slaps and crashes. They love to breach and sail and sky hop and they get their name from the way their body arches as they emerge out of the water to prepare to dive back down again! This is a great value Mozambique resort and especially good for couples looking for a romantic getaway. Other great lodges to spot whales in the Inhambane include Barra Beach Club, Casa Delight, and Travessia Beach lodge. The amazing Bazaruto Archipelago is one of the sweetest spots for whale watching enthusiast during whale season. We urge you to visit this region to witness this once in a lifetime spectacle. There are plenty of accommodation options in Bazaruto Archipelago but we recommend these spots for the best whale watching experience; &Beyond Benguera Lodge, Anantara Bazaruto Island Resort & Spa and Azura Benguerra Lodge. Azura Retreats on Benguerra Island remains our top selling luxury beach resort in the islands of Bazaruto. And we have some unbeaten holiday packages to Mozambique and Azura from South Africa with flights included. Vilanculos is most popular for honeymoons and diving. But this region is situated right on the coast boasting white beaches and clear water making it an ideal location to do some whale watching. We recommend embarking on a dhow safari and getting up close and personal with these friendly giants. The best locations in Vilanculos for whale watching would be the resorts on the coast, we recommend Bahia Mar Club , Dugong Beach Lodge Villa Santorini. Bahia Mar Mozambique is really good value accommodation and has an awesome reputation for its service. Villa Santorini Mozambique is a five star beach resort in Vilanculos and is some of the best villa accommodation in Mozambique. Another great place to stay to see the whale migration is Casa Babi in Vilanculos, a deluxe beach hotel offering comfy self-catering and full board accommodation. This quaint, little seaside Mozambique beach resort is perfectly placed to take in the views across the blue blanket of the sea to the islands of the Bazaruto Archipelago. The Quirimbas is both remote and unspoiled so whale watching here is really special and some of the best in Mozambique. There are 32 islands for you to explore and discover from just a handful of lodges. Ibo Island Lodge is by far the best because of its bay and proximity to deep water. Whales regularly come in close to the shore and you can see them whilst snorkeling for dolphins at the lighthouse reef. A real treat to see both these marine mammals at the same time! Boat based whale watching in Mozambique and the Quirimba Islands is in a class of its own. Azura Quilelea Private Island offers stylish five-star accommodation. So if budget is not an issue then go there for an amazing Mozambique holiday and see some whales! Top of the list for luxury island lodges in the Quirimbas! The Villas at Vamizi and Medjumbe Anantara are also good options depending on your choice of accommodation. 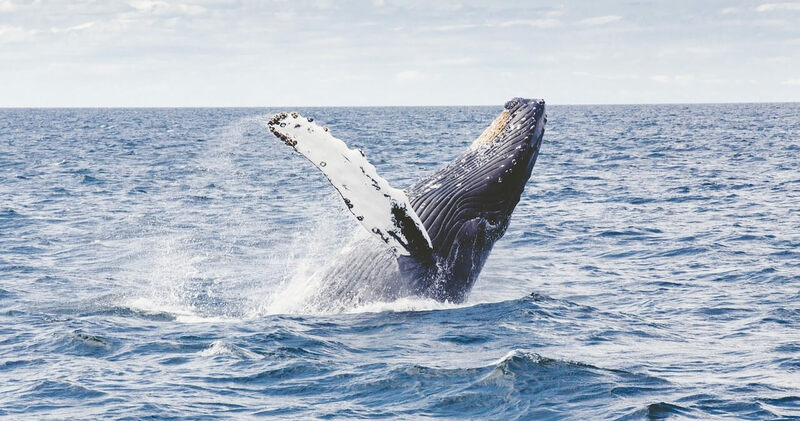 You will be introduced to the magnificent migratory Southern Right whales and the Humpback whales as they swim past the East African coastline. Both species are baleen whales which use their baleen or filter-feeder system inside their mouths to feed on krill and plankton. The baleen system works when a whale opens its mouth underwater and the whale takes in water. The whale then pushes the water out, and animals such as krill are filtered by the baleen and remain as a food source for the whale. Baleen is similar to bristles and is made of keratin, the same substance found in human fingernails and hair. Humpback and Southern right whales have a rather playful temperament when not being threatened. Your whale watching experience will put you in a front row seat to observe the aerial antics of these magnificent creatures defy the laws of nature. Humpbacks are considered the acrobats of the great whales and can breach (push their upper bodies above the surface) as high as 10 meters! These whales have a friendly and a curious nature and are known to approach whale-watching boats or even spend a few minutes in the close range of/and underneath these boats. Lob-Tailing where they lie vertically in the water with their heads down, slapping the water continuously with their tails. Sailing where whales are stationary in the water with their head down and only their tails sticking out. 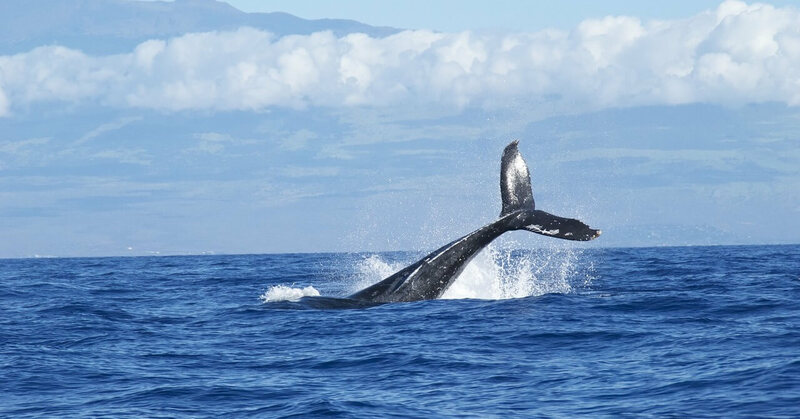 Flipper slapping is when whales surface on their backs and loudly slap their pectoral fins onto the water. Spy-hopping where whales push their heads right out of the water as if they spying on you. The humpback whales sing spine-chilling songs. The male makes the long, loud, complex “songs” for which the species is famous and which can last up to 20 minutes long. Humpbacks may sing continuously for more than 24 hours but because they have no vocal cords, these whales sing by forcing air through their massive nasal cavities! 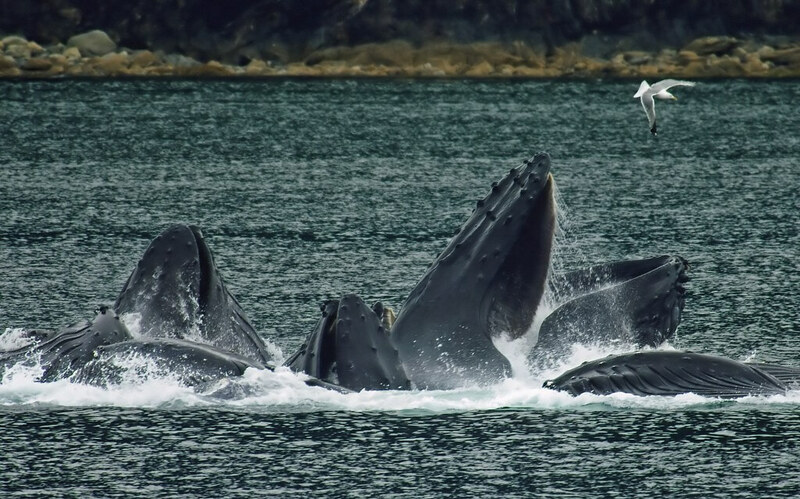 While scientists still don’t know the real reason why Humpback whales sing, it is interesting to note that all North Atlantic Humpbacks sing the same song, and those of the North Pacific sing a different song. Did you know that the Humpback whale uses a very clever technique to catch its food known as bubble net feeding? What happens is a group of whales swims in a circle, getting closer and closer in as they keep blowing bubbles below a school of prey. The prey (krill or plankton) is encircled in the shrinking ring of bubbles and is then trapped in a cylinder shape that keeps getting smaller. This ring can begin at up to 30 meters wide and several Humpbacks can be involved. The whales then suddenly swim upward through the “net”, mouths agape, swallowing thousands of fish in one gulp. Wow! The Southern Right Whale has a hairier head than most other whales and is recognized for its huge callosities or horny growths on its head behind the blowhole, on the chin and around the eyes and lower lip. These whales have two blowholes so when they blow, the water makes a particular shape in the air above them. Right whales were hunted by whalers who knew they were rich in blubber, therefore the “right” whales to hunt. Females can be more than 15 meters long and 54 tons in weight! The survival of this species is being threatened. Climate change is currently impacting on whales as sea levels rise and temperatures change. The Arctic and Antarctic habitats are facing threats right now which could affect whales sooner than we realize. If the krill and plankton populations decrease, whales will really be in trouble. Come to Mozambique to see the whales! Maybe you will feel so tuned into these giant sea mammals that you will want to contribute to their on-going survival? Not only does Mozambique offers a majestic whale watching experience, but also world-class holiday accommodation in luxury island villas, slick city hotels, and elegant beach lodges. We have what it takes to get you there in style and we guarantee you attractive and affordable package deals where you get to see the whales up close on ocean cruises and diving. Contact Mozambique Travel for any advice on the ideal locations for whale watching in Mozambique and whale watching packages with accommodation and flights!